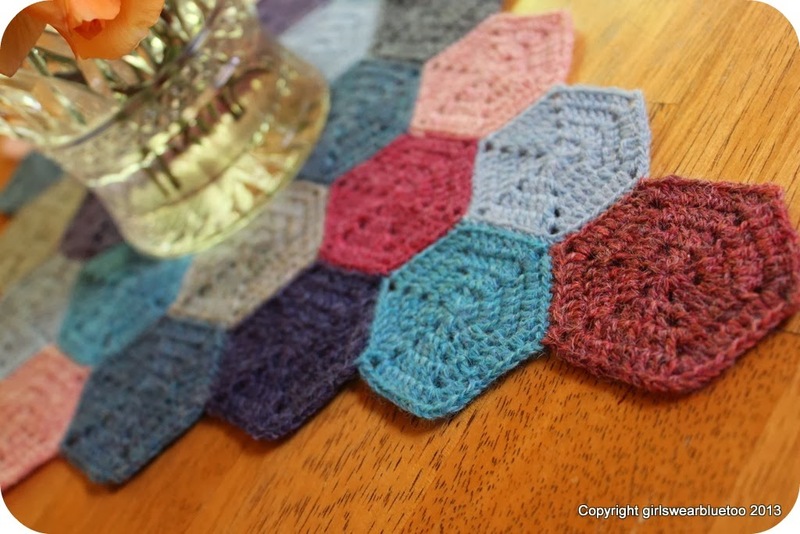 Have I told you that crochet Hexagons are invading my thought space? If you follow me on Instagram you will have seen this table runner I made over the last week or two, as it was coming together you may have had a peek on Facebook or Flickr too. 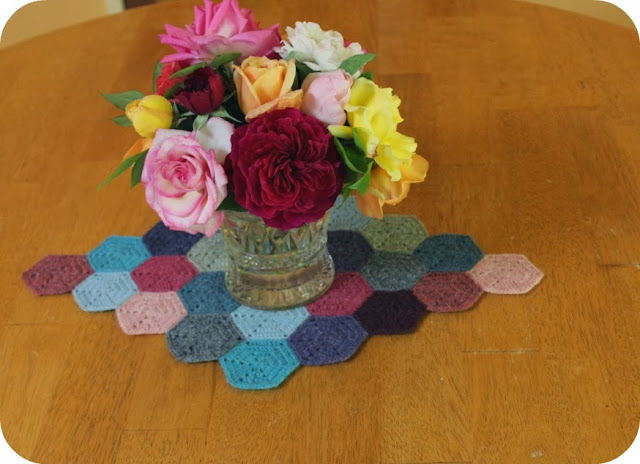 I started out intending it to be circular to sit on my round table, I joined my first little hexie flower with blue yarn, but when I Completed all the crochet hexagons and started to join the second tier I realised that the blue join wasn't cutting it for me visually any more, I wanted them to meld together apparently seamlessly. 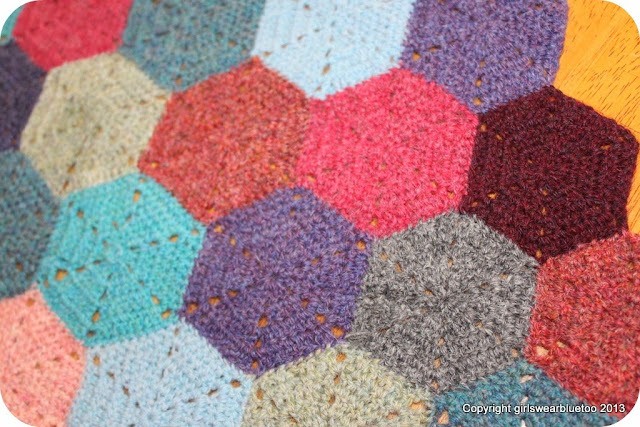 As I was unhappy with the blue I pulled it all out very carefully and from then on joined with the colour of the hexagon I was adding, or that of an adjacent colour. I used a whip stitch through the back loop seam, which is the first time I have joined this way and it worked really well I'm so pleased with the result and found this method of joining with a needle quite soothing in the process. 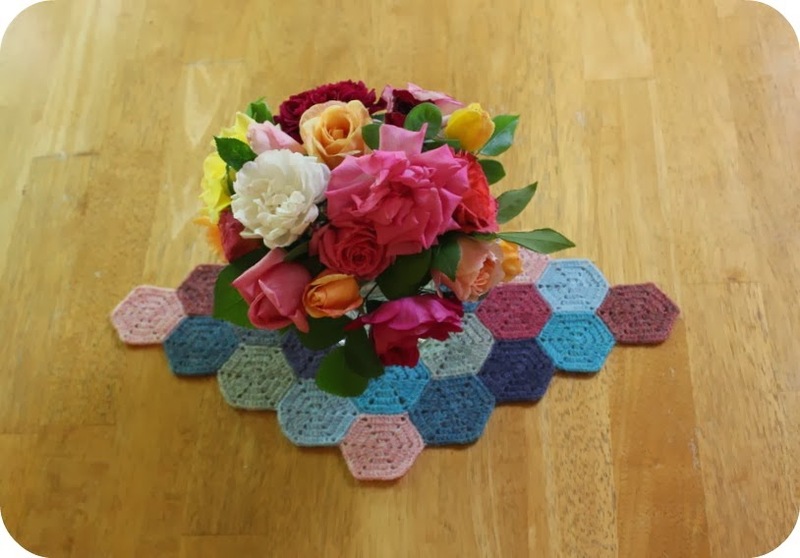 When I had added all the completed Hexagons into the work the circular shape didn't please me so I set to work again and added another half dozen to end up with this. These hexagons are quite small, they would fit in the palm of my hand. I used a 2.00 mm hook and the yarn I used is Holst Garn Supersoft wool, I love the earthy toned quality and subtle shade variation each & every colour seems to have about it. Walking into my meals area and seeing this on the table adds so much Happy to my Day. 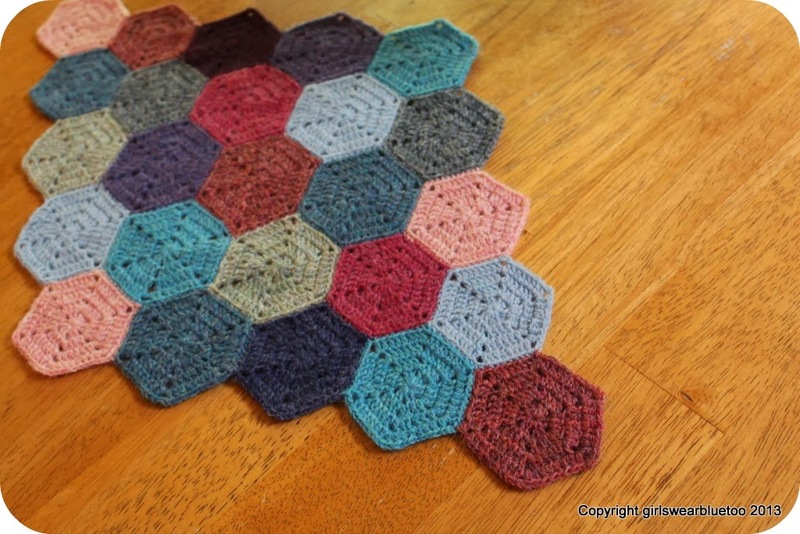 I haven't worked the Hexagons out of my system yet and have another pattern in production now. using the same size hook and Same yarn though the motifs are much bigger. I think it will be another table topper as its a bit too lacey to work as a throw or cushion cover in my house with children, where we snuggle under the throws on the couch. Thanks so much Jo. I'm really pleased with it. This is so lovely Tammy!! Thanks gorgeous, it really is so soft and lovely.